Water (Aqua), Paraffin, Polybutene, Styrene/acrylates/ammonium Methacrylate Copolymer, Beeswax (Cera Alba), Bisdiglyceryl Polyacyladipate2, C1836 Acid Triglyceride, Palmitic Acid, Stearic Acid, Triethanolamine, Vp/eicosene Copolymer, Acacia Senegal Gum, Hydroxyethylcellulose, Phenoxyethanol, Tetrasodium Edta, Butylene Glycol, Caprylyl Glycol, Tocopheryl Acetate, Sodium Laureth12 Sulfate, Glycerin, Potassium Sorbate, Sericin, Calcium Chloride, Sodium Hyaluronate, Tilia Tomentosa Bud Extract, Citric Acid, Bht, Sorbic Acid. [+/: Iron Oxides (Ci 77491, Ci 77492, Ci 77499), Ultramarines (Ci 77007), Chromium Oxide Greens (Ci 77288), Chromium Hydroxide Green (Ci 77289), Titanium Dioxide (Ci 77891)]. they're Real! 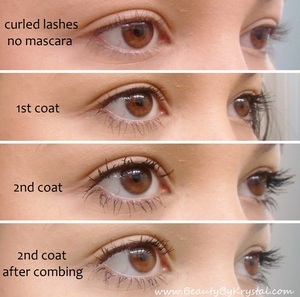 Mascara lengthens, curls, volumizes, lifts & separates. Benefit's long-wearing formula won’t smudge or dry out. A specially designed brush reveals lashes you never knew you had! Position wand horizontally & wiggle brush from side to side, base to tip, to achieve maximum volume, length & lift. Hold wand vertically & stroke upward to curl & separate. Layer generously as desired. I am super picky on my high end mascaras. I usually only buy them when they are samples that I get in a palette or when I buy them off of Hautelook, On occasion, I will go ahead and splurge on hyped mascaras to see what its about. This time, I was lucky enough to have been sent this precious gem before it was released. I have to admit, I was intrigued by this mascara. It had a flash sale in 6 cities... how can I not be interested in a mascara that the company is hyping like crazy? Well Benefit, I have to hand it to you... You guys know your mascaras. There are many aspects of this mascara that makes it stand out among the others so it is hard to decide where to start! The formula is not too wet and not too dry. It is super black, non clumpy, non smudging AND light weight. I do not have to use a primer for this mascara, it applies well and when it dries, my lashes do not feel brittle or stiff. They feel soft and smooth and it does not weigh down my eyes. Since the formula dries to a flexible finish, my lashes have not been breaking or falling out as much, which is lovely! Now.. the pink elephant in the room.. the brush. This is an interesting brush. When I first took a peek at it I thought to myself "Holy cow.. that's a lot of brush!" The bristles are rubber and staggered from tall to short and at the tip of the brush, it is domed off with longer rubber "spikes". It claims that when used horizonally you will achieve length and volume and when used vertically you can curl, define and lift. I have been using this since I have received it and I can see why this is already sold out! This has become a staple in my make up routine, especially this summer where all I wear is tinted moisturizer and this mascara. I just hope they come back in stock before I run out of mine!! 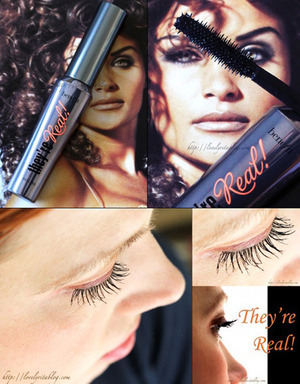 Since this mascara is called "They're Real! ", I assumed it's claiming to give me that false-lash effect. I have used this mascara for about 2 weeks now and I feel that it's just not the mascara for me. I documented two different demonstrations to show how this mascara looked on my lashes curled and uncurled. I also included a demonstration of how I normally wear my lashes. The brush of this mascara is plastic with rather short teeth, and the tip is a rounded shape with longer teeth. I used the shorter teeth to apply the mascara to my lashes horizontally, then I used the rounded tip to apply the mascara to my bottom lashes and inner/outer corners. My lashes normally don't like plastic mascara wands (they prefer the traditional bristle wands), and this mascara did not prove to be any different. I find that the wand applies too much mascara to my lashes, making them look spidery and clumping multiple hairs together instead of separating them like it claims to do. Even after combing out my lashes (which I usually do in my regular lash routine), the formula dried to a sticky consistency which just clogged up my lash comb and made my lashes look even more spidery. My Final Thoughts: I feel the Benefit They're Real! Mascara is not suitable for longer lashes; the formula is thick, wet and tends to clump, plus you really need to work with it to look as decent as I got them in my photos. On the other hand - if you have short lashes and need more product on them for them to stand out, this mascara might just be up your alley. I did notice this mascara doesn't smudge, melt, or flake all day (tested on many 12hr days). Overall, I won't be switching from my staple Benefit BadGal Lash Mascaras. I also wanted to add, there are a lot of positive reviews on this mascara as well, so for me personally this mascara just didn't flatter my lashes at all - but if you check out Benefit's Facebook page, there's tons of ladies with before/after photos to show how it boosted their lashes. This is probably the most controversial mascara in recent times, from what I’ve read around you either love it or hate it. I am not that extreme, i don’t ‘love’ it but I like it a lot, it does everything it says in the bottle (or the cardboard in this case). With just one layer, it gives you long straight eyelashes and it separates, extends and lifts them immediately. Besides it’s a real black, a real jet black so it highlights the eyelashes perfectly. With a couple of layers and a bit of work is my perfect mascara to wear with black eyeliner and red lips. Removing it is a bit complicated, you almost need an industrial paint stripper for that, it is true that it stays on all day and doesn’t leave you with those annoying blackish particles around the eyes, but in order to achieve that they had to make this a little bit too strong mascara because even using different eye makeup removers for waterproof mascaras it takes a lot of effort and rubbing, my eyes end with a bit of irritation and the next day when I wake up I still have some remains of it over my eyelids. With that in mind, i wouldn’t recommend it for a daily use , although the effects are really attractive (and addictive, it really looks nice on) but unfortunately I do not think that the health of my eyes would allow that. But i do not deprive myself of wearing it once or twice a week. First of all, I don't buy high-end mascaras. Ever. I normally wouldn't invest on something that has to be used up within 3 months. Anyway, this was sent to me by the good people of Beautylish, and I must say, it's very impressive! The brush itself is very interesting - it's basically made up of rubbery spikes, with a spiky domed tip to catch the shorter lashes. I wiggle the mascara over lashes, because touching up on areas that I've missed out with the tip. I also use to the tip on my lower lashes. Overall, this is a lovely product. I have typical sparse Asian lashes, so finding a decent mascara can be tricky. This baby, however, is a dream to use. It's not clumpy and it does separate the lashes, leaving them silky. I like how it doesn't dry up too quickly, nor does it flake. It doesn't volumize as much as I hoped it would though. Didn't see much of a curling effect either, but I highly doubt any mascara can curl your lashes - you'll still need a proper lash curler. There is a new mascara on the block and this one is not to be messed with! Ok so I have to admit…I am a mascara JUNKIE! I have so many mascara’s that they should make a Hoarders special edition just for me. Covergirl Lash Blast is one of my all time fav drugstore brands but this new mascara from Benefit is slowly becoming my new department store go-to! The formula is nice and thick which the drag queen in me ALWAYS loves but I think the REAL trick is in the brush! I have used many a brush but I’ve actually never seen a brush like this. It was specially designed just for this mascara and it’s features are the pro and cons of this product. I like that there is sparseness in between the hard bristles (I prefer the hard plastic ones better than a fluffy brush). It really helps to pay attention to details and makes the biggest impact when applying the product. The spiked ball topper is GREAT for getting the smaller lashes close to the tearduct. The only CON of this product is because the brush is sparse it tends to pick up alot of product which may result in clumping. For me it’s not a problem because I want that Tammy Faye Baker FIERCENESS but for those who want a more toned down look I suggest scraping the brush onto the top of the mascara container to prevent overuse of product. All in all Benefit did a GREAT job with this mascara and I am looking forward to seeing more innovative products from them in the future! I bought this with high expectations and They're Real did NOT disappoint! It lengthens and separates my lashes. I usually have a problem with mascaras looking dry on my lashes throughout the day, but Benefit They're Real mascara gives a kind of "wet" and lush look that I love. I did curl my lashes with an eyelash curler once before applying the mascara, but it has held a curl for hours. It was definitely worth the $22 that I spent on this mascara! False eyelashes in a tube! This mascara is incredible. The brush is slightly course, and you need to give your lashes some tough love if you want to make your peepers look wide and sparkly. I'd recommend curling before, and possibly using your every day mascara first, wiggling at the base, before going the whole hog with this product. (I use Max Factor Masterpiece Max.) This is simply because when looking for the false, wide-eyed effect, you need to layer and quite honestly I wouldn't want to waste a brilliant mascara like this one. Teamed with a slick of black liquid eyeliner your eyes will look amazing. My friend (a makeup artist) raves about this mascara. I recently bought a tube and O.M.G...it's better than I anticipated. Thanks to genetics I have lush, long lashes but that doesn't mean it's easy to find mascara for these babies. I have to be weary of clumping & gathering so I don't have tarantula lashes! I must say, Benefits "They're Real Mascara" separates my lashes beautifully while also curling them! I have not used a lash curler since my purchase (which is unbelievable to me b/c normally my lashes stick straight out when not curled). I am amazed & totally hooked. WELL WORTH IT! I was pleasantly surprised with this product I wasn't expecting much from it but after a couple of layers found it was adding length instantly. It doesn't add too much volume but that doesn't bother me it's the length it gives that I love, I don't like wearing false lashes so this is a treat for me. Bit pricey but if you don't mind spending it, it's definitely worth it. My lashes are kind of long already, and I tend to avoid mascara because of that. I feel like it's not something I absolutely need. Using this product, I can say that I have been using mascara every single day since I got it. I'm not sure if the it's the formula or the brush. Maybe it's a combination of both. The bristles are staggered and kind of looks like a spiney thorn. It has lots of spikes that grab onto your lashes like a magnet. I've noticed that it lifts the lashes from the root and pulls them up for a slight curl. It gives me a doll-like eye. My lashes do look almost fake at times. It's super voluminous, without looking clumpy. It's probably because of the brush that really seperates the lashes too. It doesn't smudge or fade either. It stays on throughout the day and it doesn't lose volume. Some mascaras I find lose volume as the day progresses (much like hair products). This one stays puts. This is one of Benefit's best products, and I am super impressed.